Well it’s not Vangelis playing, it looks like Casio’s Mike Martin has been doing some programming. Very cool. There is no question that Apple’s iPad has been embraced by professional musicians and hobbyists alike for its music making capabilities. Applications such as Apple’s GarageBand, Moog’s Animoog and SampleWiz offer some incredible capabilities and are really inexpensive (excluding the cost of the iPad itself). It is clear that Casio recognized the importance of the iPad when they were designing the XW series. They even made a place to put one! Better yet they made it easy to integrate it but there are a couple things you’re going to need to get started. First, you’re going to need an ordinary USB Cable. Next you’ll need Apple’s iPad Camera Connection Kit. 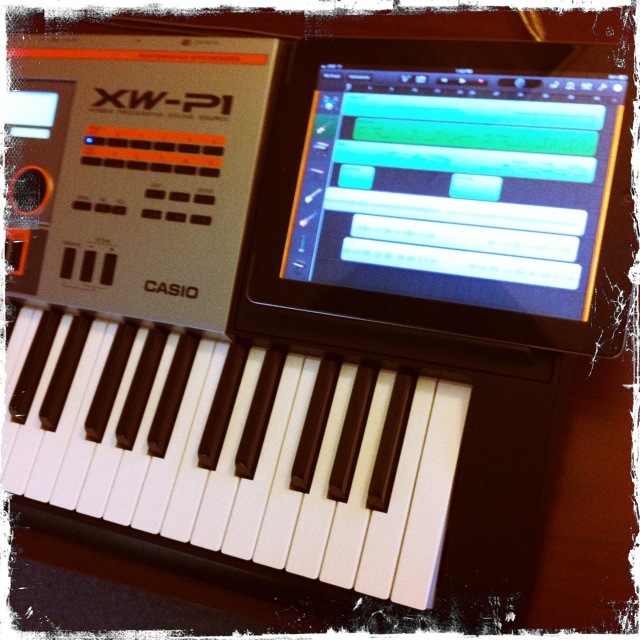 The two of these things combined allow you to use the XW as a MIDI controller for your iPad. Last you’re going to need an audio cable. The XW synths have an 1/8″ audio input on the back. So simply connect the headphone output from the iPad to the audio input on the back of the XW. I found it convenient to get one of these right angle adapters so the iPad could still sit comfortably on the iPad and the audio cable was conveniently tucked away. Now you’re ready. What you’re doing to do with it depends on your application. You can set up the iPad to be one of your zones in Performance mode and play the iPad apps from the keyboard. You could also an iPad instrument as one of your parts in the Step Sequencer. We’ll get into both applications in one of our next posts. So get some Apps and the Camera Connection Kit and get ready!! They say this will be the first of many “how to” videos on the XW-P1. They’re off to a great start! Wow, leave it to Daniel Fisher to unlock the capabilities of the XW-P1. Check out this performance. It just started. We’re anxious to hear what Craig Anderton has to say about the XW-P1.